The body of Lt. Andrew Nuttall is on a Christmas Eve flight back to Canada from Afghanistan. 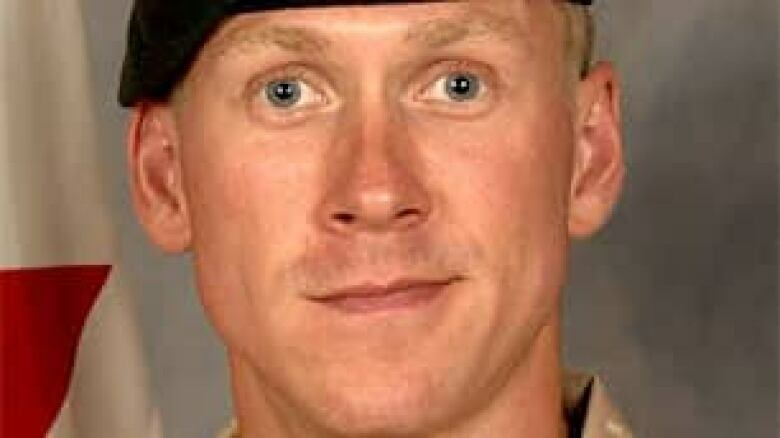 Lt. Andrew Richard Nuttall was killed in action in Afghanistan on Wednesday. Nuttall, of Victoria, was on a routine foot patrol when he and an Afghan army soldier were killed Wednesday. An Afghan interpreter was seriously injured in the blast. A few hours after Nuttall's death was announced, thousands of soldiers assembled at Kandahar Airfield for a repatriation ceremony after which Nuttall's body was loaded on a military aircraft. The names of the Afghan soldier and interpreter were not released. The bomb detonated near the village of Nakhonay in Panjwaii District, about 25 kilometres southwest of Kandahar city. Nuttall, 30, belonged to the 1st Battalion Princess Patricia’s Canadian Light Infantry based in Edmonton. He is survived by his mother Jane and father Richard. "Andrew came to Afghanistan because he honestly thought he could make a difference to the people of Afghanistan," said Brig.-Gen. Daniel Menard, commander of coalition forces in Kandahar province. "He wanted to lead from the front and set the example, attributes he passionately displayed every time he was in front of his platoon." Menard described Nuttall as generous, someone who always had a smile on his face and "greeted everyone he met with enthusiasm and goodwill." "From the first day I met him, I knew Andrew was special," said Nuttall's commanding officer, Lt.-Col. Jerry Walsh. "There was nothing that could get him down," Walsh said, describing Nuttall as a cold-water surfer, a disc jockey, a teacher and a superb athlete. "He was everything Canadian. A young man possessed of great energy and enthusiasm for life, and so giving of everything he had to everyone else," he said. At the time of his death, Nuttall was searching for Taliban transit routes, Menard said. "His patrol was part of our efforts to protect the people of the village from insurgents." In British Columbia, Premier Gordon Campbell expressed deep sadness over Nuttall's death. The premier said Nuttall "showed courage, bravery and dedication in service to his country and to all Canadians," and added the people of British Columbia send their thoughts and prayers to Nuttall's family, who live in Victoria. During this time of family and togetherness, Campbell said, Nuttall's loss is a reminder of the sacrifices made by the members of Canada's military who work to protect the freedoms Canadians treasure. Nuttall posted photos from Afghanistan on his Flickr account and also wrote a blog on his tour of duty. His last post, from Dec. 1, describes how much he enjoyed being part of two separate dinners to celebrate the Muslim festival of Eid with locals. He also wrote about his tour being extended. "All of us here (including me) are not worried about this extension. We all believe in what we’re doing and an extra few weeks isn't going to hurt anyone in the long run (as long as we maintain our vigilance of course). Plus if I end up getting home then, I'll get to celebrate my b-day with lots of friends and family." It's the first death of a Canadian soldier in almost two months. Sapper Steven Marshall was killed Oct. 30 in a similar incident. A total of 134 Canadian soldiers have been killed since the Afghan mission began in 2002.